Syrian refugees living in mid Wales have set up their own pop-up restaurant. 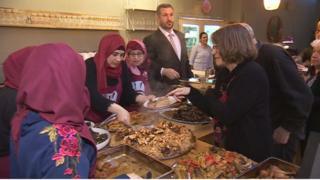 At a sell-out event in Aberystwyth, families from Syria cooked for 120 people. The project, run by the British Red Cross, aims to help families integrate into their new communities. The first families arrived in the town in 2015. Since then, work has been ongoing in helping the refugees settle there. The Syrian women and business founders now hope to take their pop-up restaurant across Wales, and the rest of the UK. Ghofran Hamza, aged 20, who is studying in the UK, said she hopes the business "will gain popularity". "This food and these events are amazing, because I see people enjoying themselves. We put a lot of love and feelings into the food, and I love to see people receiving that love," she said. "We are not a charity, we wanted to set up this business for ourselves, and for our children's future. "We actually have big plans, we would hope to grow and become more popular. The main goal is to become a pop-up restaurant across different cities, not only in Wales, but across England, Scotland and Ireland too." The event in Aberystwyth was the fourth pop-up restaurant to be held - and the most ambitious yet. Rose Bewick, from the British Red Cross in Aberystwyth, said: "This event is really important for integration. "These women have arrived here as refugees, but actually they're so much more than that label. "These events challenge the idea that they're victims. They are people with something valuable to share, something worth celebrating and something actually worth paying for."